Softshell crabs are blue crabs that have recently molted their shell. Crabbers catch them just before they're beginning this process and hold them in tanks during, a cycle that's dictated by water temperature, weather and the moon's phases. North Carolina blue crabs usually start to molt mid-April. Mild, sweet and buttery. Slightly crispy exterior with a meaty center. Locals Seafood sells softshell crabs alive, fresh cleaned or frozen cleaned (the latter two meaning the face, gills and apron have been removed, but the "mustard" is still intact). Live crabs are the freshest you can buy, though you'll have to do some cleaning and prep before you cook. Store live crabs in a refrigerator until you are ready to do so. Live crabs won't live in a refrigerator very long, so it's best to buy them the day you plan to cook them. First, cut the face off. Next, grab a corner of the shell and lift to expose gills, which look like beige colored pointy tongues, and remove. Repeat on the other side of the crab. Flip the crab over to expose its belly; there, you will find a flap of skin called the apron. For male crabs, it will be long and thin; for female crabs, it will be wide. Lift the apron with your fingers and remove from the body. Voila! Now you're ready to start cooking. A blue crab's hard outer shell forces them to molt & produce a new larger shell in order to grow. A mature crab molts about 20 times in its life, increasing its size by one-third with each new shell. This cycle takes about 4-5 days from start to finish. Now that you've prepped your softies for cooking or purchased them cleaned, heat a quarter-inch of oil in a cast iron skillet to 365 degrees. Using a fork, poke holes in belly and legs to release any water. Pat dry well. Water, again, is the enemy! Season seafood breader with salt and pepper. 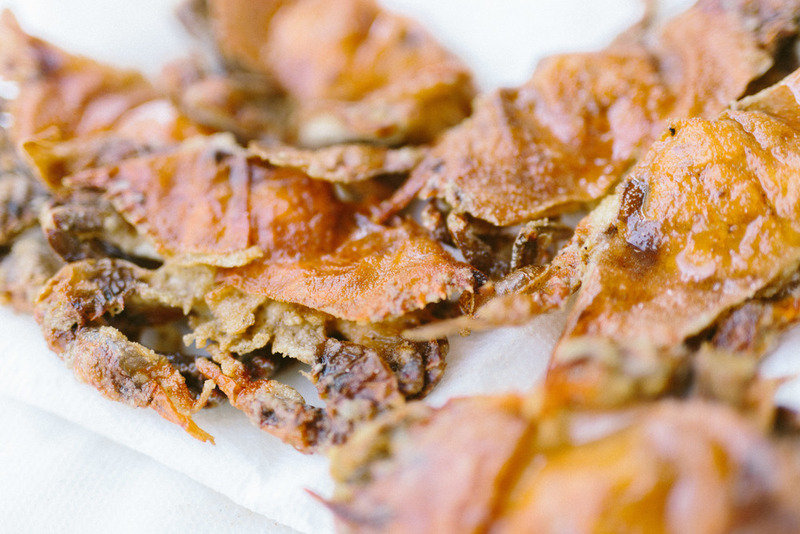 Lightly toss softcrabs in seasoned breader, covering the entire crab. Lay softcrabs in frying pan belly-side down (shell-side up). Cook for approximately 1 to 2 minutes, until golden brown, and flip for approximately 30 seconds to 1 minutes. Drain on paper towels. Serve as soon as they are cool enough to eat and finish with the World's Best Tartar Sauce. Work all ingredients together in a bowl. Chill 1 hour before serving. Learn how to prepare a simple peel & eat shrimp party favorite with Locals Seafood, a seafood company changing the game by supplying fresh, local seafood to the Triangle.